Joseph Smith hand selected a group of loyal followers in 1844, establishing a secretive group that became known as the Council of Fifty. The LDS Church today describes the organization as a “… group chaired by Joseph Smith with the purpose of laying the foundation for a theocracy in preparation for the millennial reign of Jesus Christ” (The Joseph Smith Papers, Administrative Records, Council of Fifty, Minutes, 2016). The group’s purpose was multi-faceted, including establishing a theocratic rule of government upon the Earth, supporting Smith’s run for the office of President of The United States, and exploring westward locations to succeed from the U.S. Government. The organization was meant to be the municipal department of the Kingdom of God upon the Earth, from which all law would emanate. In some future state, Joseph envisioned himself as presiding over the theocratic kingdom anointed as King, second only to the King of Kings, Christ himself. In similar fashion as Mormon temple covenants, new members were required to swear allegiance and accept related penalties (The Mormon Hierarchy, Quinn, 128-129). The Book of Mormon revolves around the notion that America is a land of promise for the House of Israel [Indians]. Righteous Gentiles could of course gain adoption into the tribe, but the Lamanites alone were prophesied to “blossom as the rose” (D&C 49:24) prior to Christ’s return and reign from New Jerusalem. 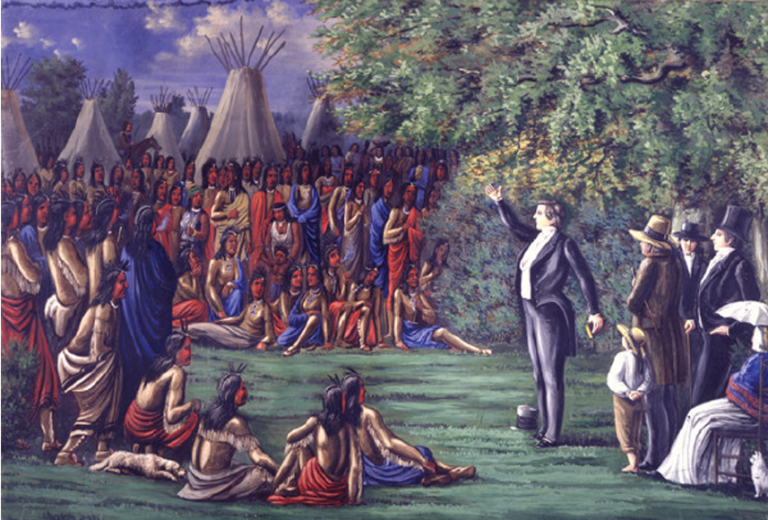 Mormonism’s first proselytizing mission was directed toward Native Americans in June 1830. “…I will establish my church among them, and they shall come in unto the covenant and be numbered among this the remnant of Jacob [Indians], unto whom I have given this land [America] for their inheritance; And they shall assist my people…[to] build a city, which shall be called the New Jerusalem” (3 Nephi 21:22-23). The role of the American Indian in LDS doctrine is not limited to mere redemption from their fallen state. The Book of Mormon prophesies that the Indians would one day go forth “as a lion” to lay waste to their oppressors and reclaim the land of their inheritance. The Indians were to “go through among them [Gentiles], and shall tread them down, and they shall be as salt that hath lost its savor…to be trodden under foot of my people…” (3 Nephi 16: 14-16). “I say unto you, that if the Gentiles do not repent…after they have scattered my people- Then shall ye, who are a remnant of the house of Jacob [Indians], go forth among them; and ye shall be in the midst of them who shall be many; and ye shall be among them as a lion among the beasts of the forest, and as a young lion among the flocks of sheep, who, if he goeth through both treadeth down and teareth in pieces, and none can deliver. Thy hand shall be lifted up upon thine adversaries, and all thine enemies shall be cut off…” (3 Nephi 20: 15-17). LDS doctrine elaborates on the destruction which would surely befall America at the hands of the Indians. “And my people who are a remnant of Jacob shall be among the Gentiles, yea, in the midst of them as a lion among the beasts of the forest, as a young lion among the flocks of sheep, who, if he go through both treadeth down and teareth in pieces, and none can deliver. Their hands shall be lifted up upon their adversaries, and all their enemies shall be cut off. Yeah, wo be unto the Gentiles…I will cut off thy horses out of the midst of thee, and I will destroy thy chariots; And I will cut off the cities of thy land, and throw down all thy strongholds… And I will pluck up thy groves out of the midst of thee; so will I destroy thy cities… And I will execute vengeance and fury upon them…” (3 Nephi 21:12-21). Joseph Smith himself prophesied strongly, in the name of the Lord, of America’s pending destruction and rise of Zion. “I am prepared to say by the authority of Jesus Christ, that not many years shall pass away before the United States shall present such a scene of bloodshed as has not a parallel in the history of our nation. Pestilence hail famine and earthquake will sweep the wicked of this generation from off the face of this land to open and prepare the way for the return of the lost tribes of Israel from the north country. …Repent ye and embrace the everlasting covenant and flee to Zion [Missouri] before the overflowing scourge overtake you. For there are those now living upon the earth whose eyes shall not be closed in death until they see all these things which I have spoken fulfilled” (as printed in American Revivalist, also Rochester Observer, Joseph Smith, Jan 4, 1833). The rise of the literal ruling city named New Jerusalem was not an ambiguous threat to non-Mormons, as Joseph Smith clearly manifest its Missouri location in the name of the Lord. “A revelation of Jesus Christ unto his servant Joseph Smith, Jun., and six elders, as they united their hearts and lifted their voices on high. Yea, the word of the Lord concerning his church, established in the last days for the restoration of his people, as he has spoken by the mouth of his prophets, and for the gathering of his saints to stand upon Mount Zion, which shall be the city of New Jerusalem. Which city shall be built, beginning at the temple lot, which is appointed by the finger of the Lord, in the western boundaries of the State of Missouri, and dedicated by the hand of Joseph Smith, Jun., and others with whom the Lord was well pleased. Verily this is the word of the Lord that the city New Jerusalem shall be built by the gathering of the saints, beginning at this place, even the place of the temple, which temple shall be reared in this generation. For verily this generation shall not all pass away until an house shall be built unto the Lord, and a cloud shall rest upon it, which cloud shall be even the glory of the Lord, which shall fill the house” (D&C 84:1-5). Thus, Mormon doctrine was a very real threat in American frontier towns where Indian relations remained tenuous. While Indian sympathizers were gaining prominence, few other religions were promoting the subversive notion that God himself would soon raise up the Indians to destroy America. In large part due to their belief that Mormonism was destined to assume a global theocratic leadership role in God’s grand restoration plan, early LDS leaders chafed under America’s budding democratic experiment, particularly where state’s rights led to Mormon expulsion from Missouri and tension in Illinois. “A man is not an honorable man if he is not above the law, and above government… The law of God is far more righteous than the laws of the land; the laws of God are far above the laws of the land. The kingdom of God does not interfere with the laws of the land, but keeps itself by its own laws” (Times and Seasons, Sidney Rigdon, May 1, 1844). Lyman Wight summarized the Council’s vigorous opposition to the U.S. Government due to its perceived persecution of the Mormon people when he proclaimed, “[The U.S. Government] is a damned wrotten [sic] thing…” Brigham prophesied, “I tell you in the name of the Lord when we go from here, we will exalt the standard of liberty and make our own laws. When we go from here we dont calculate to go under any goverment but the government of God. There are millions of the Lamanites who when they understand the law of God and the designs of the gospel are perfectly capable of using up these United States. They will walk through them and lay them waste from East to West. We mean to go to our brethren in the West & baptise them, and when we get them to give hear to our council the story is told” (Council of Fifty Minutes, 1 March 1845). It is one thing to merely believe the American Indians should be united to overthrow an unrighteous U.S. Government, and quite another to proactively pursue that goal. The Council of 50 minutes reveal how Joseph Smith, and subsequently Brigham Young’s emissaries whispered reminders to various Indian tribes of how the land belonged to them, that they should unite and use force to reclaim God’s intended glory. The Church confirms Joseph’s desire to establish a new constitution to govern his theocratic government beyond the authority of the United States (lds.org, Church History Topics, Council of Fifty). Early Mormon doctrine did not go unnoticed, prompting Federal Indian agents to pen letters of concern, including an 1843 warning “that a grand conspiracy is about to be entered into between the Mormons and the Indians to destroy all white settlements on the Frontier” (Letters received by Office of Indian Affairs, Henry King to John Chambers, 1824-81). This collective thought was the impetus behind the Council’s decision to send ambassadors to negotiate, in conflict with the United States, for territories in Texas and Oregon. Various regions of California were also studied as possible relocation locations – California did not achieve statehood until 1850, six years after the formation of the Council. The ambitious Council sent Orson Hyde to Washington D.C. to solicit permission for the Church to raise a military force to oversee the western territories. Brigham Young accelerated the inflammatory, separatist rhetoric soon after his arrival in the Salt Lake Valley, likely prompted by the renewed sense of protection the mountains and harsh climate afforded. By 1857, there remained only one U.S. official in all of Utah, as the Mormons had driven all others out under threat of death. Council rules instructed William Clayton, as scribe, to record and prepare minutes to be read at the next meeting, whereupon they would be burned. He often destroyed the minutes, but he and others frequently made notes in their personal diaries, based on the exciting discussions held in the meetings. When Joseph was arrested in 1844 for destroying the opposition press in Nauvoo, he was also charged with treason for declaring martial law in Nauvoo. Understanding the damage the Council’s notes would cause, Joseph instructed his loyal scribe William Clayton “to burn the records of the kingdom, or put them in some safe hands and send them away or else bury them up.” Fortunately, Clayton preserved the records by burying them in his garden, soon thereafter transcribing the clandestine journals into three small books. On February 27, 1846, Clayton crossed into Iowa Territory with the records in his possession. The records made it safely to Salt Lake City, where they remained closely guarded by the Church. Anti-government rhetoric and violent doctrines, such as blood atonement, escalated nearly unchecked in Utah territory under Brigham Young’s leadership. Young declared in Sept 1857 the State of Deseret (Utah) to be a free and independent people, no longer bound by the laws of the U.S., while ordering California and Nevada Saints to sell their property and return to Zion to fight the Government. The U.S. Congress declared Utah to be in state of insurrection, sending troops to remove Brigham Young as Governor. As the Army approached in 1858, the Council of Fifty records were again buried for several years to prohibit the incriminating philosophies from further exacerbating relations. 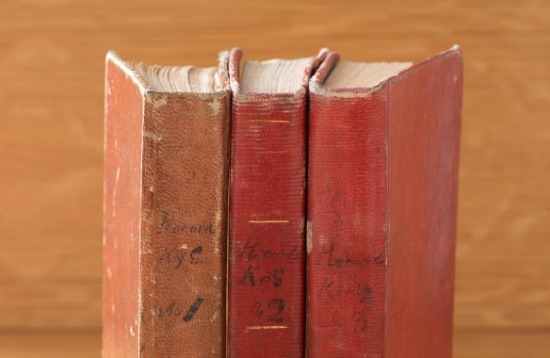 The Church continued to carefully guard the records for generations, restricting access, first publishing the Council’s minutes in September 2016. February 15, 1844 – Members in Wisconsin Territory suggest the “table lands” in Texas as a possible gathering place. February 20, 1844 – Joseph Smith and the apostles at Nauvoo begin planning an expedition to Oregon territory and Mexican territories of California to secure a new settlement location. March 14, 1844 – The Council sends Lucien Woodworth to Texas to negotiate Mormon settlement with Texas president Sam Houston. April 4, 1844 – The Council sends Orson Hyde to Washington D.C. to petition Congress to make Smith an Officer in U.S. Army with power to raise 100,000 troops to patrol western territories from Texas to Oregon. May 3-6, 1844 – The Council approves plans for Wisconsin Mormons to settle in the Republic of Texas. June 27, 1844 – Joseph Smith is killed. February 4, 1845 – The Council is reorganized, Brigham Young is appointed leader. February – March 1845 – The Council considers sites for settlement outside the United States, including territories in Texas, Oregon and California. March 11, 1845 – News of the annexation of Texas by the United States reaches Nauvoo, after which Mormons no longer consider Texas a viable gathering place. April 23, 1845 – LDS emissaries visit Indian tribes west of Missouri River to discuss obtaining refuge. August 1845 – Leaders receive positive reports about Salt Lake area. August 27 – 31, 1845 – Leaders meet to discuss exodus plans and potential locations. January 11-19, 1846 – The Council meets to finalize preparations to move west. February 4, 1846 – First group of Mormons crosses the Mississippi River into Iowa Territory. February 27, 1846 – William Clayton crosses into Iowa Territory with Council of Fifty records. The Joseph Smith Papers, Administrative Records: The Council of Fifty, Minutes 3/44 – 1/46.